Just when I thought I was becoming smarter than my smartphone, I learn that new cars are now smarter than their owners. Personally, I don’t want a car smarter than I am. In fact, cars equipped with every computer gadget that you never knew you needed are becoming the topic of conversation at dinner parties and automotive conferences. Many people long for the days when the radio had two knobs—one to turn it on and set the volume, and another for tuning into the station. Last November at the In-Mold Labeling/Decorating conference during a presentation by a company that provides molded-in electronics for the automotive industry, a discussion arose about how difficult and dangerous all of these new computer-aided features really are—and why so few in the room liked them. In particular, the touch screen was deemed the most difficult and dangerous. It’s one thing to be sitting at your desk operating the touch screen on your computer, or sitting on the sofa with your mobile phone or your iPad; it’s quite another to have to operate a touch screen while speeding down the freeway at 75 mph. Ah-h-h, but don’t worry. If you begin to drift into another lane inadvertently, a sharp beeping noise will warn you to get back into your own lane. “I have to pull off to the side of the freeway to operate my touch screen,” one attendee at the meeting said. While there are laws in many states against texting and driving or even using a handheld mobile phone, there are no laws—or statistics—on how many wrecks are caused because the driver was trying to find something on a touch screen. Use voice activation, they say. Well that would be great except one of the most reported aggravations from consumers is that the feature often does not recognize what they are saying. 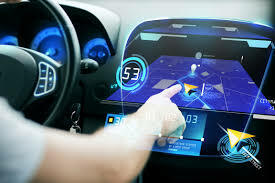 In a feature article in the May 11 edition of the Wall Street Journal , “Your New Car’s Best Tech Feature May Be the ‘System Off’ Button,” Christina Rogers provided numerous instances of the difficulties new car owners have with their connected cars. One woman with a new BMW 640i couldn’t get her voice-activated calling feature to recognize her husband’s name. Also her car beeped incessantly while backing out of her driveway or while going through a car wash. Perhaps BWM got the idea for back-up warning beeps from the heavy construction industry that first began installing back-up warnings on bulldozers and excavators at job sites. Hey, if it works for Caterpillar, why not BMW? he nearly lost his Airstream over the side of the cliff. A local came along and helped him save the RV and led him out onto a major highway. “How in the world did you even find this road?” the local guy asked my ex. “My navigation system brought me here,” my ex replied. “Yeah, that seems to happen a lot,” the local replied, shaking his head in bewilderment. Another problem the guy had with his Acura was the voice activation system not recognizing the songs he wanted to hear or the artist he wanted to listen to, always giving him artists or songs that he didn’t want to hear. Reports of incessant beeping and touch screens scrolling wildly without being touched were among other problems. Rogers notes in her article that all the problems people are having with their dashboard features raise doubts among consumers that self-driving cars will be much better. Consumers responding to various surveys, including one from AutoTrader.com and another from Deloitte, state that they want only standard features on their car dashboards. To quote one of my favorite engineers, William F. Banholzer: What’s possible isn’t always what’s practical. I’m going to have to buy a new car soon. My 2001 Infiniti G20, while in excellent condition and well-cared for, is old enough that parts are becoming more difficult to find. But I’m in the category of just give me “standard features” – I don’t want a car that is smarter than I am. Or at least thinks it is.